The comments were Trump’s first about massive wildfires, including a blaze that incinerated most of the Northern California town of Paradise and killed at least nine people. Wildfires also raged in Southern California, including the town of Thousand Oaks, where a gunman days earlier killed a dozen people at a local bar. Trump earlier issued an emergency declaration providing federal funds to help firefighters. A Southern California wildfire continues to burn homes as it runs toward the sea. But winds that drove the ferocious flames have eased. Forecasters say the 50-mph gusts won’t return until Sunday, and hard-pressed firefighters hope to use that respite to make progress in halting the spread of flames. Even so, TV reports show homes, palm trees and even power poles erupting in flames. The Woolsey fire and smaller Hill blaze have destroyed more than 150 homes and prompted evacuation orders for about 250,000 people from Thousand Oaks northwest of Los Angeles to the celebrity enclave of Malibu. There’s no word on what sparked the fires Thursday. But winds are blamed for pushing the fire through scenic canyon communities and ridgetop homes. Pacific Gas & Electric Company says it will cooperate with any investigations stemming from a massive wildfire in Northern California. The utility told state regulators Thursday that it experienced a problem on an electrical transmission line near the site of the blaze minutes before the fire broke out. The company said it later observed damage to a transmission tower on the line. PG&E spokeswoman Lynsey Paulo said Friday the information was preliminary and stressed that the cause of the fire has not been determined. The fire has killed at least nine people and destroyed more than 6,000 homes. It forced the evacuation of roughly 30,000 people in the town of Paradise, about 180 miles (289 kilometers) northeast of San Francisco. Some residents forced to flee a growing inferno in Southern California faced a big obstacle getting their large animals to safety. None may have had it harder than Eva Loeffler (AY-vuh LEFF-lur), who didn’t have a trailer for her 20-year-old pony, Minnie. Loeffler, of Westlake Village, says frantic equestrians were loading horses into trailers as embers rained down and she couldn’t get a lift for the little equine, so she improvised. Minnie trotted alongside Loeffler’s car on a rope for more than a mile as flames jumped the road, sirens wailed from passing rescuers and helicopters buzzed overhead. Eventually a couple with four dogs, three horses, two parrots and a pig stopped and made room in their trailer. Loeffler says they squished Minnie inside and drove to an evacuation center. A Northern California sheriff says only one of the nine people who died in a wildfire was found inside a home. Butte County Sheriff Korey Honea said Friday that three people were found outside homes and four people inside vehicles. He said another victim was found near a vehicle but outside it. All the victims were found in the town of Paradise, which was evacuated as a result of the fire. Authorities say they conducted numerous rescues Friday as they fought the flames, including using helicopters to rescue five people in the nearby community of Magalia. The sheriff says they have taken 35 reports of missing people. Authorities say nine people have been confirmed dead in a Northern California wildfire. Butte County Sheriff Korey Honea said Friday that some people were found inside their cars and others outside their homes. One victim was found near a vehicle but outside of it. He says he doesn’t have all the details on the circumstances of the deaths. Sheriff’s officials earlier had reported six deaths. Authorities say the fire burning around the town of Paradise has become the state’s most destructive since record-keeping began. This item has been clarified to show one person was found outside a vehicle. Ventura County and Los Angeles County fire officials say a wildfire in Northern California has destroyed more than 6,500 structures and grown to 140 square miles (362 square kilometers). Fire officials said Friday the destroyed structures include 6,453 homes and another 260 commercial structures. The fire is burning around the town of Paradise. The mayor of Thousand Oaks says that three-quarters of his city is under fire evacuation orders and that most likely includes people affected by the deadly bar shooting this week. Mayor Andy Fox spoke Friday about the back-to-back crises his city faced when a wildfire threatened the city the day after a gunman killed 12 people at a country music bar. Fox says the distinction between the two events is that the victims of the Borderline Bar and Grill and their family members experienced a permanent loss they may never recover from. So far, he says, no one has died from the fire that has burned into the city. Fox says that the fire is serious situation, but that homes can be rebuilt. Fire officials say Southern California wildfires have burned 150 homes and that number will rise. Authorities also announced Friday that a quarter of a million people are under evacuation orders as wind-whipped flames rage through scenic areas west of Los Angeles and burn toward the sea. At a news conference, officials said 75 percent of the Ventura County city of Thousand Oaks has been emptied. The entire celebrity enclave of Malibu also is under evacuation orders. Twin fires erupted Thursday and were pushed by winds of up to 60 mph through coastal foothills and canyons. The Hill fire has burned 6,000 acres and isn’t advancing, but the Woolsey fire a few miles away doubled in size to 35,000 acres. Los Angeles County fire Chief Daryl Osby says winds are dying down tbut will roar back to life on Sunday. A sheriff’s spokeswoman has confirmed a sixth death in a Northern California wildfire that has forced tens of thousands of people to evacuate. Butte County Sheriff’s Office spokeswoman Megan McMann said Friday she did not have details on the circumstances of the death. Sheriff’s officials said earlier that five people were found dead in vehicles that were torched by flames in the same area in the town of Paradise. They said the five could not immediately be identified because of the burns they suffered. Paradise is 180 miles (289 kilometers) northeast of San Francisco. California has been granted federal funds to battle devastating wildfires that have destroyed entire neighborhoods and killed at least five people. President Trump has issued an emergency declaration providing aid to help state and local firefighters battling blazes in Butte, Ventura and Los Angeles counties. The money will help pay for firefighting aircraft along with shelter, supplies and transportation for the tens of thousands of evacuated residents. The wind-whipped fires have destroyed blocks of homes in the Northern California town of Paradise, where five people have died. Other fires in Southern California have destroyed many homes and threaten thousands of others. Pacific Gas & Electric Co. says it experienced a problem on an electrical transmission line near the site of a massive fire in Northern California minutes before the blaze broke out. The company said in a one-paragraph summary filed Thursday with state utility regulators that it had experienced an outage on the line about 15 minutes before the fire started. The company said it later observed damage to a transmission tower on the line near the town of Paradise. The fire has killed at least five people and destroyed hundreds of homes. Paradise is 180 miles (289 kilometers) northeast of San Francisco. The filing was first reported by KQED News. Fire officials have not determined a cause for the blaze. Paradise town councilmember Melissa Schuster lost her 16-acre Chapelle de L’Artiste retreat, a posh property with a chapel, pond and pool. But Friday she was clinging to glimmers of hope inspired by two furry llamas — Shyann and Twinkle Star Heart. “Somehow they made it through,” Schuster said. She had stopped trying to hook up a trailer for the animals and fled the home and property with just three cats on Thursday when the day turned pitch black as fire and smoke roared in. On Friday she was trying to stay positive. She’d heard her son’s home and hay barn survived, along with Town Hall and even some parts of the hospital. Blocks and blocks of homes and businesses in a Northern California town have been destroyed by a wildfire. Parts of the town of Paradise were still on fire on Friday. At least five people in the town died. Patrick Knuthson, a fourth-generation resident of Paradise, said only two of roughly 22 houses on his street survived. Knuthson stayed behind and was able to save his home. He said he lost his previous home to a wildfire in 2008. Butte County Sheriff Kory Honea said about 20 deputies have also lost their homes. A surgical nurse who evacuated from a Northern California hospital with a wildfire roaring nearby says she had to return after her vehicle went up in flames and one of her pant legs caught fire. Nichole Jolly said Friday that she helped evacuate patients Thursday from Adventist Health Feather River Hospital in the town of Paradise, where at least five people died. When she tried to leave, she got stuck in the firestorm. She said firefighters extinguished her smoldering pants, covered her in a fire blanket and brought her back to the hospital, where she waited out the fire. She said doctors extinguished burning trees around the hospital to try to keep the flames at bay. Jolly eventually escaped the town. Nurses and patients have recounted their dramatic escapes from a hospital in a Northern California town that was devastated by a ferocious wildfire. Nurse Darrel Wilken told the Chico Enterprise-Record newspaper on Friday that the fire in the town of Paradise came so quickly that he and other employees at the Adventist Health Feather River Hospital used their own cars to evacuate patients. Wilken said he took three patients in his car and that two of them were in critical condition. He says he battled gridlocked traffic on a road surrounded on both sides by fire. Paradise resident Cody Knowles said his wife, Francine, was having gallbladder surgery Thursday morning. When the evacuation was announced, she was still asleep from anesthesia. He waited until she woke up and they escaped in a hospital employee’s car. The hospital says it evacuated 60 patients to other facilities. A road into a Northern California town devastated by wildfire is eerily deserted. There were no signs of life Friday on the road toward the town of Paradise except for the occasional chirping of a bird. A thick, yellow haze from the wildfire hung in the air and gave the appearance of twilight in the middle of the day. Strong winds had blown the blackened needles on some evergreens straight to one side. A burned out car with its doors open sat on the shoulder. Five people have been found dead in Paradise from the fire, and sheriff’s officials say they are investigating additional reports of fatalities. Thousands of buildings were destroyed. The town of 27,000 about 180 miles (289 kilometers) northeast of San Francisco was completely evacuated. The Santa Monica Mountains National Recreation Area has tweeted that Southern California’s huge wildfire has apparently destroyed the TV and movie production location known as “Western Town” at the historic Paramount Ranch. The National Park Service says it has no details or photos but the structures that formed Old West facades are believed to have burned on Friday. The location set in the mountains west of Los Angeles dates to 1927 when Paramount Pictures leased the ranch and began making films there. Filming continued for decades even as the ranch changed hands. It was acquired by the National Park Service in 1980 but has continued to function as a filming location. When not in use for filming, visitors could stroll through Western Town while hiking or ride through on horseback. A Northern California sheriff says authorities are trying to confirm reports that more than five people died when a wildfire devastated the town of Paradise. Five people were found dead in vehicles Friday but Butte County Sheriff Korey Honea told television stations KHSL/KNVN in Chico that additional reports of deaths are being investigated. Honea said flames and downed power lines in Paradise are preventing deputies from reaching some areas. The five victims were found in vehicles in the same area of the town, where residents described traffic jams and panic as they tried to escape flames on Thursday. Thousands of buildings were destroyed in Paradise, about 180 miles (289 kilometers) northeast of San Francisco. A mandatory evacuation order for the entire city of Malibu has been reinstated as one of California’s major wildfires bears down on the enclave called home by many Hollywood stars. A city-wide evacuation was ordered early Friday and then was scaled back. But it has been extended again to include all of Malibu, a city of about 13,000 stretching along 21 miles (34 kilometers) of coast west of Los Angeles. Traffic is jammed on sections of Pacific Coast Highway. Some residents have evacuated to the parking lot of popular Zuma Beach. A Northern California university has closed its campus and cancelled weekend events because of a fast-burning wildfire. But officials with California State University, Chico posted on Twitter Friday that the campus is not under evacuation and that dining halls and residence halls remain open. The university says the fire has not entered Chico city limits and is moving away. Chico has a population of about 93,000 people and is 15 miles (24 kilometers) west of the town of Paradise, which was destroyed by a fire that killed at least five people. Paradise is 180 miles (289 kilometers) northeast of San Francisco and drifting smoke from the fire has made the air unhealthy in the San Francisco Bay Area. Jessica Van Amber searched shelters, called around and appealed to people on social media to help her find her aunt and mom missing after a ferocious Northern California wildfire. Van Amber her uncle called report the women were safe and on their way out Friday morning to reunite with relatives in San Francisco Bay Area. She says the women stayed in the home overnight while the fire took over the neighborhood and eventually sought shelter in their car. Early Friday, they drove out of town and made contact with relatives. Sheriff’s officials in Northern California say the five people found dead in vehicles torched by a wildfire’s flames could not immediately be identified because of the burns they suffered. The Butte County Sheriff’s Office said Friday that autopsies will be conducted. Officials say the victims were found in the same area in the town of Paradise, near a main thoroughfare heading out of the town that was consumed by flames. All of the city’s 27,000 residents were ordered to evacuate on Thursday as the wildfire quickly turned into an inferno. Many residents said traffic jams developed as they left as panicked people fled, some abandoning their cars to try to escape on foot. The fire has grown to nearly 110 square miles (285 square kilometers). Northern California officials say investigators found five people dead in vehicles that were torched by the flames of a ferocious wildfire. The Butte County Sheriff’s Office said Friday the victims were found in the same area in the town of Paradise. A California National Guard official says 100 military police are headed to Northern California to help evacuate people from a wildfire. Maj. Gen. David Baldwin says other military personnel are studying satellite imagery to assess the scope of the damage and map the fire. The ferocious fire near the Northern California town of Paradise has grown to nearly 110 square miles (285 square kilometers). Smoke from the fire has made the air unhealthy in the San Francisco Bay Area. Fire officials say evacuations due to a raging Southern California wildfire are expected to reach about 148,000 and structural losses are expected to be significant. The so-called Woolsey Fire burning west of Los Angeles has surpassed 15 square miles (39 square kilometers) Friday morning and is continuing to grow. Los Angeles County Deputy Fire Chief Dave Richardson says 45,000 people in Ventura County and 43,000 more in Los Angeles County were ordered to evacuate overnight. Richardson estimates another 60,000 people will likely have to evacuate because the fire jumped U.S. 101 early Friday and is pushing toward the coast. He says the fire’s pace forced firefighters to focus on life-protection rather than saving structures and he expects that yet-to-be-determined number to be significant. Another fire to the west has burned more than 9 square miles (23 square kilometers) in Ventura County but has slowed since reaching the footprint of a fire stripped away vegetation in 2013. California Department of Forestry and Fire Protection Director Ken Pimlott said Friday firefighters are focused on saving lives and are still rescuing people from fires. The fire near the Northern California town of Paradise has grown to nearly 110 square miles (285 square kilometers). Another fire northwest of Los Angeles has been swept southward toward the ocean by strong Santa Ana winds. Evacuation orders were issued for residents of the beachside community of Malibu. A New Hampshire woman says she and her brother are frantically trying to get information about their 83-year-old mother, who lives in the California town of Magalia near the devastated town of Paradise. Diane Forsman says Jean Forsman can’t walk and is on oxygen. She and her brother posted on Facebook and Twitter Thursday asking if anyone had seen their mother. They tried calling 911 and other numbers. They were told that officials had a list of 300 to 400 welfare checks to do. Finally they got word through Facebook that someone in her neighborhood had picked up a disabled woman but they haven’t been able to confirm whether it’s their mom. The director of the California Governor’s Office of Emergency Services says fires across California have forced 157,000 people from their homes. Mark Ghilarducci provided the figure at a news briefing on Friday. Fires are burning in Northern and Southern California. The director of the California Governor’s Office of Emergency Services says a fire in Northern California has claimed lives. Mark Ghilarducci said Friday the number of deaths was not known. He said there are also injuries. He says the magnitude of the destruction is unbelievable and heartbreaking. The fire near the town of Paradise has grown to nearly 110 square miles (285 square kilometers). Some people who escaped a roaring wildfire in northern California spent the night at a church in the nearby city of Chico. Residents of the town of Paradise told harrowing tales Friday of a slow motion escape from a fire so close they could feel it inside their vehicles as they sat stuck in terrifying gridlock. They say it was like the entire town of 27,000 residents decide to leave at once. Fire surrounded the evacuation route and drivers panicked, some crashing and others abandoning their vehicles to try their luck on foot. Many of the rural residents have propane tanks on their property and the tanks were exploding. Authorities have issued an unhealthy air quality alert for parts of the San Francisco Bay Area as smoke from a massive wildfire drifts south, polluting the air. 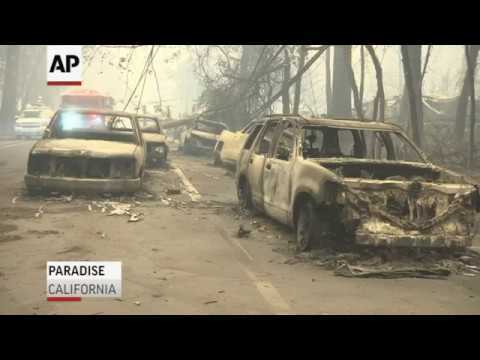 Officials say the thousands of structures in the town of Paradise, 180 miles (290 kilometers) northeast of San Francisco, were destroyed by the blaze that has charred 110 square miles (285 square kilometers). At least 40,000 people have been displaced. The air in San Francisco Friday is hazy and the smell of smoke is overwhelming, prompting officials to declare air quality unhealthy. They are advising older people and children to move physical activities indoors. All people are encouraged to limit their outdoor activities. The city of Malibu has reduced the scope a mandatory evacuation order for the beachside community as a wildfire approaches. Malibu officials initially said the order issued early Friday applied to the entire city but have now defined an area that is approximately the western two-thirds of the community. The fire erupted Thursday northwest of Los Angeles and has been swept southward toward the ocean by strong Santa Ana winds. Johns says heavy winds continue to drive the fire but winds are expected to ease Friday afternoon, which could give firefighters an opportunity to start containing it. A California fire official says a blaze in Northern California nearly quadrupled in size overnight. Capt. Scott McLean of the California Department of Forestry and Fire Protection says the fire near the town of Paradise has grown to nearly 110 square miles (285 square kilometers). A raging Southern California wildfire has triggered a mandatory evacuation order for the entire beachside city of Malibu. The fire broke out Thursday northwest of Los Angeles and roared southward, jumping the U.S. 101 freeway early Friday and sweeping into the Santa Monica Mountains. Malibu has about 13,000 residents and lies along 21 miles (34 kilometers) of coast at the southern foot of the mountain range. Officials in Northern California say a wildfire that devastated a town of 27,000 is moving north and have ordered people in two Sierra Nevada foothill communities to leave their homes. The Butte County Sheriff’s Office says an evacuation ordered was issued Friday for the small communities of Stirling City and Inskip, north of Paradise, where thousands of homes were destroyed. Cal Fire Capt. Bill Murphy says winds have calmed down in the valley but that there are “shifting, erratic winds” with speeds of up to 45 miles per hour (72 kph) along ridge tops. The blaze that started Thursday morning east of Paradise and decimated the town also spread to the west. It reached the edge of Chico, a city of 90,000 people Thursday night. Murphy says firefighters were able to stop the fire at the edge of the city, where evacuation orders remained in place. Wildfires raging west of Los Angeles have forced school closures. Pepperdine University has canceled classes Friday at its Malibu and Calabasas campuses. The Calabasas campus is also evacuated. Malibu public schools are also closed. To the west in Ventura County, Moorpark College is closed due to the impacts of fire and Wednesday night’s deadly mass shooting in nearby Thousand Oaks. California Lutheran University had already canceled Friday classes due to the shooting. Cal Lutheran says its Thousand Oaks campus is not under evacuation orders but residential students have been put on standby. The Thousand Oaks-area Conejo Valley Unified School District also has closed all its schools. Two wildfires raging west of Los Angeles have force thousands of people to leave their homes. The flames are being driven by Southern California’s notorious Santa Ana winds, which blow from the northeast toward the coast. Both fires erupted Thursday afternoon and have grown rapidly. One fire that broke out near the northeast corner of Los Angeles has roared westward, jumped U.S. 101 in the Calabasas area and is surging up the Santa Monica Mountains. Evacuations have been ordered on the edges of the Northern California city of Chico, which is about 15 miles (24 kilometers) from a town where thousands of buildings were destroyed by a fast-moving wildfire. Capt. Scott McLean of the California Department of Forestry and Fire Protection says flames from the blaze that devastated the town of Paradise had reached the eastern side of Chico, a city of about 90,000 people. Authorities have said that at least two firefighters and multiple residents were injured in Paradise. McLean said Friday morning that he had no immediate update on injuries. He says strong winds made it difficult for aircraft to drop retardant effectively on the fire. A fast-moving wildfire that ravaged a Northern California town Thursday sent residents racing to escape on roads that turned into tunnels of fire as thick smoke darkened the daytime sky. A Cal Fire official said thousands of structures were destroyed. Harrowing tales of escape and heroic rescues emerged from Paradise, where the entire community of 27,000 was ordered to evacuate. Witnesses reported seeing homes, supermarkets, businesses, restaurants, schools and a retirement home up in flames. The fire was reported shortly after daybreak in a rural area. By nightfall, it had consumed more than 28 square miles and was raging out of control. Authorities say at least two firefighters and multiple residents were injured.